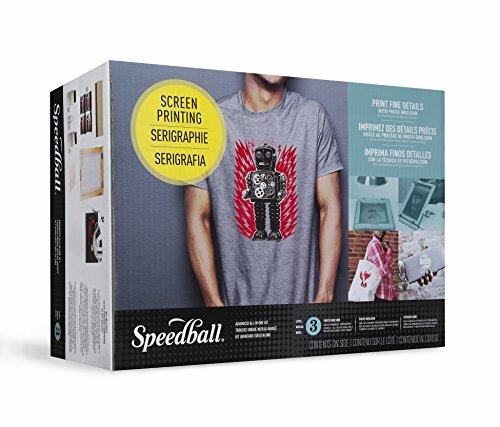 This Advanced All-in-One Screen Printing Kit by Speedball is perfect for the Photo Emulsion method of screen printing. This kit contains everything that you need to start exploring this exciting method of screen printing. Perfect for t-shirts, posters, pillow cases and more this kit includes: one 10"x14" screen, squegee, one 4 ounce jar each of Black, Red, White, and Blue ink, one 3.3 ounce bottle of Diazo Photo Emulsion, sensitizer, one 4 ounce bottle of photo emulsion remover, two transparencies, one lamp and bulb, lamp clamp,four craft sticks, a sheet of black paper, and instructions.